Marketing pressures, regulatory policies, clinical guidelines, and consumer demand all affect health care providers' knowledge and use of health-related genetic tests that are sold and/or advertised to consumers. In addition, clinical guidelines, regulatory policies, and educational efforts are needed to promote the informed use of genetic tests that are sold and advertised to consumers and health care providers. A shift in culture regarding the regulation of genetic tests that are sold directly to consumers is suggested: by recent actions taken by the US Food and Drug Administration (FDA), including letters sent to direct-to-consumer (DTC) genetic testing companies stating that their tests meet the definition of medical devices; by public meetings held by the FDA to discuss laboratory developed tests; and by the convening of the Molecular and Clinical Genetics Panel to gather input on scientific issues concerning DTC genetic tests that make medical claims. This review provides a brief overview of DTC advertising and the regulation of pharmaceuticals and genetic tests in the United States. It highlights recent changes in the regulatory culture regarding genetic tests that are sold to consumers, and discusses the impact on health care providers of selling and advertising genetic tests directly to consumers. The pharmaceutical industry exerts tremendous influence on medical practice through the marketing of drugs and medical devices to physicians and consumers. Direct-to-physician advertising (DTPA), which is common in most developed countries, occurs through sales pitches from pharmaceutical representatives who provide details about specific drugs (physician detailing) and through providing free samples, continuing medical education, advertising in medical journals, and direct mailings [1, 2]. Direct-to-consumer advertising (DTCA), which is legally permitted only in the US and New Zealand, primarily occurs through broadcast and print advertisements. DTCA on the internet, however, reaches an international audience . In the US, direct-to-consumer (DTC) marketing of pharmaceuticals dramatically increased in 1997 after the US Food and Drug Administration (FDA) loosened regulation of broadcast advertising . The revised guidance stated that DTC broadcast advertisements only had to include a major statement of risks and make adequate provision for consumers to obtain the FDA-approved product labeling . Although spending on DTPA still outweighs spending on DTCA [2, 6, 7], the amount spent on DTCA continues to rise. Between 1996 and 2005, DTCA spending increased 330% to $4.2 billion . Congruent with the change in the regulation of broadcast advertising and advances in genetic technology, the past decade has seen a significant increase in the availability of health and non-health related genetic tests that are sold and advertised directly to consumers by for-profit companies . Health-related genetic tests are clinical genetic tests that provide information to support the diagnosis, prevention or treatment of a disease (for example, carrier, pre-symptomatic, susceptibility, pharmacogenetic and nutrigenetic tests) . Examples of health-related tests that are the focus of this review include genetic testing for single-gene disorders that have large effect sizes (for example, tests for the BRCA breast-cancer genes or carrier tests for cystic fibrosis) and single-nucleotide polymorphism (SNP)-based genomic risk profiling for drug response and susceptibility to complex diseases such as diabetes, cancer, and heart disease. Genome-wide analysis studies currently form the basis of risk-profiling tests and tend to have small effect sizes (odds ratio <1.5) . Examples of non-health-related tests include paternity and ancestry testing. There are also tests that predict height, athletic performance and cognitive traits (Table 1). There are two primary scenarios for advertising and selling drugs and tests to consumers. The first is the advertisement directly to the consumer of a drug or test that must be prescribed or ordered by a health care provider (HCP). Examples include any medication that requires a prescription and most genetic testing for single-gene disorders. The second scenario is the advertisement and sale of a test directly to consumers (direct-access testing). Examples of direct-access tests that consumers can purchase for home use (the user collects the sample, and performs and interprets the test) include urine tests for pregnancy or ovulation and blood glucose tests. For home collection tests, the user collects the sample but the sample is sent to a laboratory for testing; sometimes the user interprets the results themselves, sometimes the results are phoned back to the user and counseling is provided. Examples of home collection tests include tests for HIV1 antibodies and hepatitis C, and genomic risk profiling for disease susceptibility and drug response offered through companies that sell genetic tests DTC . In 2011, the Genetics and Public Policy Center provided a list of genetic tests for over 350 conditions or traits that were advertised or sold DTC and the companies that sold those tests. Two-thirds of DTC-testing companies offered direct-access testing, whereas about one-third marketed tests directly to consumers and physicians but required that a physician order the testing . Previous reviews have addressed the ethical, legal and social implications of DTC genetic testing (DTC-GT), consumers' views on DTC-GT, and regulatory issues that are specific to genetic testing [12–15]. 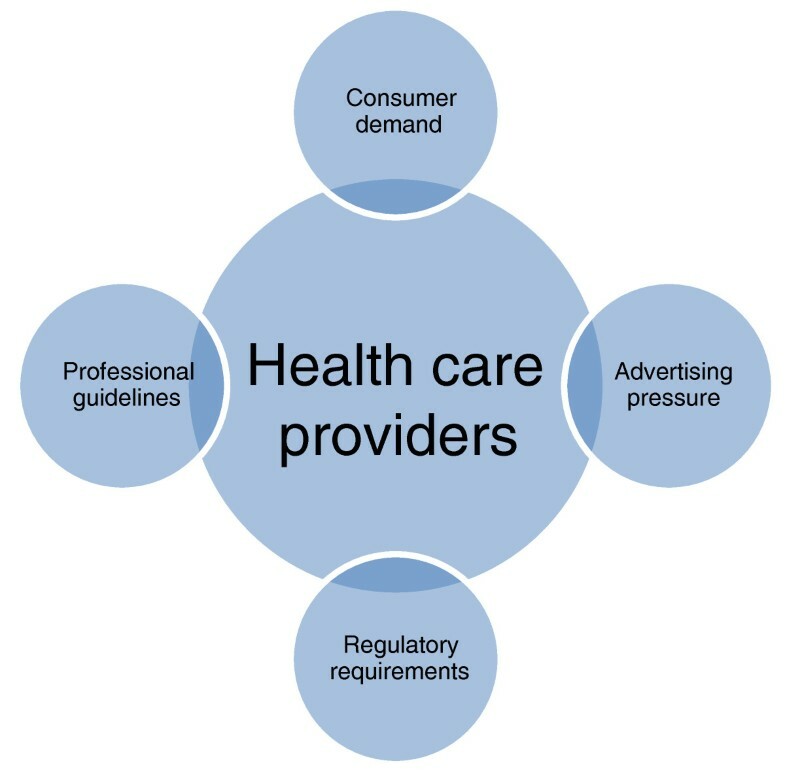 This review touches on the complex roles that marketing pressures, regulatory policies, clinical guidelines, and consumer demand play on HCPs' knowledge and use of health-related genetic tests that are sold and/or advertised to consumers. First, I provide an overview of DTCA and of the regulation of pharmaceuticals and genetic tests in the US. Then I discuss recent cultural shifts in the regulation of genetic tests offered DTC, and finally I review the literature that describes the impact on HCPs of selling and advertising DTC genetic tests. The pros and cons of DTCA of pharmaceuticals have been vigorously debated [16–23]. Proponents of DTCA claim that it helps educate consumers, generates patient-provider discussions, and empowers consumers to get involved in their own health care by seeking information on and treatment for their health conditions. Theoretically, clinicians then benefit from more thoughtful questions from patients and from increased patient and physician awareness of medications. Some also argue that DTCA encourages competition among pharmaceutical companies and leads to price reductions where there are competing drugs. Opponents voice concerns about the quality of information presented to consumers, stating that it can be misleading or misrepresent information and that it results in consumer misunderstanding, increased demand for inappropriate medications, or consumer decisions that are based on inappropriate criteria. Additional concerns include disruption of the provider-patient relationship, increased provider time spent correcting misconceptions, overprescribing of drugs and tests because of consumer pressure on providers, and increased costs to society and the health care system. Numerous studies have been conducted to determine providers' perceptions of DTCA of pharmaceuticals, as well as the impact of such advertising on provider behaviors [6, 23–30]. Results from physician surveys suggest that most physicians feel that DTCA of pharmaceuticals can help to educate consumers about available treatments and medical issues and can facilitate better discussions with their patients [24, 29, 30]. Nonetheless, physicians also feel that DTCA encourages consumers to seek medications that they do not need and that DTCA does not provide balanced information on costs, adverse events and alternative treatment options [24, 29]. Content analyses of television [31, 32] and magazine ads  support physician concerns, suggesting that advertisements do not provide balanced or consistent information on risks and benefits, disease risk factors or causes, or treatments. In addition, one study found that a college-level reading ability was needed to access the brief summary sections . Surveys of consumers suggest that DTCA increases awareness and motivates discussions between patients and providers. Different studies report that between 13% and 35% of surveyed consumers have talked to their provider about a specific medication or asked for more information as a result of DTCA [29, 30, 33, 34]. Surveys and randomized trials all suggest that consumers who request a prescription for a specific drug are more likely to receive one than are patients who do not ask for a specific treatment [26, 28], and that DTCA increases both appropriate and inappropriate prescribing of advertised drugs by physicians [7, 27, 28, 30, 35]. Although overuse of drugs wastes resources, cost-benefit models suggest that, in some scenarios, the cost of treating those without disease could be outweighed by the benefit of treating those with disease . However, treating patients with a newer, more-expensive DTCA medication that is merely a substitute for a generic or an existing less-expensive drug results in increased costs without benefit to those with disease [27, 36]. There is also concern that racial and ethnic differences in response to DTCA could exacerbate existing health disparities. Studies suggest that minorities are more likely to be influenced by DTCA of pharmaceuticals than non-minorities [29, 37], and that minorities are also more likely to ask their physicians for an advertised drug but be refused . Appropriate prescribing of medications and ordering of genetic testing will result in the greatest benefit to patients and society; and this occurs when clinical guidelines exist and HCPs are aware of them and follow them [27, 36]. The pros and cons of DTCA of health-related genetic tests are similar to those for DTCA of pharmaceuticals, with a few noted differences. A similar concern is the possibility that adverse outcomes could result from misleading portrayals of the benefits of tests by DTC-GT companies and from difficulties that consumers could have in interpreting risk information provided by DTC television ads or supplemental text materials [31, 38–40]. Such adverse outcomes could include increased anxiety, false reassurance, or inappropriate use of health care services [41–44]. The incorrect interpretation of test results by consumers is also a concern. For example, consumers could potentially change their dosage of a medication or even stop taking a medication on the basis of the results of a pharmacogenetic or other genomic risk profiling test . DTCA of genetic testing increases consumer and provider awareness of and demand for testing [45–47], but informed consent about the benefits and limitations of DTC genetic tests, and provider knowledge regarding such tests, remains a concern, particularly for SNP-based genomic risk profiling [45, 48]. Although socioeconomic status has been associated with differential awareness and interest in DTC-GT, it is unclear whether interest or use differs by ethnicity [49, 50]. The regulation of genetic tests by the FDA is limited in comparison with that of the pharmaceutical industry. Consequently, limited data are available on the clinical validity and utility of most genetic tests offered DTC. Several studies have found that SNP-based estimates of the risk of disease susceptibility vary across DTC-GT companies [51–54], and are likely to be revised as new loci are found . There is also a large gap in provider education and knowledge regarding the clinical utility of genetic tests [56–58], partly as a result of the rapid commercialization of emerging genetic technologies and tests. The benefits of direct-access genetic testing include increased patient autonomy and privacy  and increased access to genetic testing . Proponents also argue that DTCA of genetic tests increases consumer knowledge and empowers individuals to take part in their own health care . For example, in the case of hereditary cancer syndromes, DTCA may prompt those with cancer or a strong family history of cancer to pursue cancer risk assessment and to obtain the indicated genetic tests . The risk of health and employment discrimination that is based on an individual's genetic information has been reduced with the passage of the Genetic Information Nondiscrimination Act (GINA), but GINA does not protect against discrimination in applications for life, disability, or long-term care insurance [61, 62]. In addition to DTCA and DTPA of genetic tests, regulatory policies impact HCP behavior and knowledge (Figure 1). The distinction between regulation of advertising and regulation of testing is important because the lack of regulation of genetic tests influences what can be advertised. The FDA regulates drugs and medical devices, including in vitro diagnostic tests, to ensure their safety and efficacy before they are made available to consumers. All pharmaceuticals must be FDA approved before they can be advertised to consumers and most drugs that are advertised DTC go onto the market within a year after FDA approval . However, the regulatory processes for genetic tests differ from those for pharmaceuticals. The FDA regulates genetic tests that are sold as kits because they are considered to be medical devices. The FDA also regulates analyte-specific reagents (ASRs), but most genetic tests are laboratory-developed tests, which have been unregulated at the discretion of the FDA. Thus, most genetic tests are not subject to FDA review, and DTC companies have had few barriers to market entry . Indeed, in 2003, seven websites offered health-related DTC genetic tests to consumers . In 2009, the Genetics and Public Policy Center listed 39 companies offering such tests via the internet . By 2011, this number had dropped to 27  subsequent to the issuance of FDA letters to DTC companies and test manufacturers stating that the tests and services they offered appeared to meet the definition of a device and therefore needed FDA approval [65, 66]. In addition, in 2011, after the FDA issued its letters, only 20 companies were listed as offering direct-access genetic testing compared to 39 in 2009 . External factors impacting the knowledge and behavior of health care providers regarding DTC genetic testing. The Federal Trade Commission (FTC) is charged with protecting consumers against unfair or deceptive acts or practices and against false advertising for drugs, devices, or services. The FTC investigates 'false advertising' claims and regulates the advertising of over-the-counter drugs . Historically, false or deceptive advertising of genetic tests has not been actively prosecuted by the FTC because they have limited resources and because the lack of regulation makes it difficult to determine what is false advertising as opposed to innovative new use. Thus, the FTC has focused on significant safety concerns and on products or services that are marketed nationwide . In 2006, however, the FTC (along with the FDA and the Centers for Disease Control and Prevention (CDC)) developed a fact sheet warning consumers to be skeptical about genetic tests offered DTC . In 2009, the FTC investigated the marketing of the MyCellf™ Program by two DTC-GT companies but decided not to take action when both companies stopped marketing this product [70, 71]. The Centers for Medicare & Medicaid Services regulate all US clinical laboratory testing, through the Clinical Laboratory Improvement Amendments (CLIA), whether the test is ordered by consumers or providers . CLIA regulations establish laboratory standards for quality assurance and quality control, personnel, proficiency testing, and maintenance of records. Thus, the CLIA regulations focus on the quality of the testing process while the FDA regulations focus on the safety and efficacy of the test itself . Although molecular genetic testing is considered to be high-complexity testing (which requires a high degree of skill to perform or interpret), genetic testing has not been defined as a specialty area . Thus, there are no federal requirements for testing the proficiency of molecular genetic testing . The CDC recently published 'Good Laboratory Practices for Molecular Genetic Testing for Heritable Disorders and Conditions', which recommends that laboratories participate in available proficiency testing , such as that offered by the College of American Pathologists. Nonetheless, external proficiency testing programs are limited and the lack of such programs is the most common reason cited by laboratory directors for not participating in proficiency testing [75, 76]. States can choose to follow CLIA or adopt more stringent statutes and regulations. New York and Washington have state-alternatives to CLIA. States can also require HCPs to authorize laboratory tests . Thirteen states prohibit direct-access genetic testing . An added regulatory challenge is that pharmaceutical and DTC-GT companies can reach a global audience through both passive and interactive (for example, social media) internet technologies, crossing state and national boundaries [3, 63, 78]. There are no international regulations governing DTC genetic testing, further compounding concerns regarding information privacy, access to health care, informed decision-making, patient safety, and access to unbiased information [3, 79]. Many have expressed concerns about the analytical validity, clinical validity and clinical utility of DTC-GT for disease susceptibility [10, 39, 44, 80–84]. Janssens et al. reviewed the evidence supporting gene-disease associations for seven DTC companies offering SNP-based genomic risk profiles. They found that 43% of 56 genes analyzed were not reviewed in meta-analyses. The few genes that were significantly associated with disease had modest odds ratios, and overall there was insufficient evidence of the clinical validity and utility of the commercially offered genomic profiles . Others have also found that SNP-based risk information varies across DTC companies, depending on the polymorphisms tested and the disease risk of the background population used in the risk algorithms [51–54, 80, 85]. The CDC developed 'Evaluation of Genomic Applications in Practice and Prevention' (EGAPP) in 2004 to support the development of a systematic process for assessing the available evidence regarding the validity and utility of rapidly emerging genetic tests for clinical practice. EGAPP has published eight evidence-reports, and six recommendation statements based on these reports, relating to genetic tests for breast cancer, cardiovascular disease, colorectal cancer, and depression. EGAPP found insufficient evidence to recommend for or against the use of 1) tumor profiling to improve outcomes for patients with breast cancer, 2) genomic profiling for cardiovascular health to improve cardiovascular health, 3) pharmacogenetic testing of UGT1A1 to reduce morbidity and mortality in patients with metastatic colorectal cancer, or 4) pharmacogenetic testing of cytochrome P450 in adults with depression to determine treatment with selective serotonin re-uptake inhibitors. Sufficient evidence was found to recommend against the routine use of genetic testing in adults with idiopathic venous thromboembolism, and in their adult family members with no history or symptoms of thrombotic events, in medical decision making on the preventive use of anticoagulants. Finally, sufficient evidence was found to support the genetic testing of newly diagnosed individuals with colorectal cancer with the aim of reducing morbidity and mortality from Lynch syndrome in their relatives . The EGAPP recommendations make it clear that further evidence-based research on genomic profiling is needed before the tests can be integrated into clinical care. Although increased oversight of genetic tests has been recommended ubiquitously [14, 57, 84, 87–91], there was no dramatic shift in the regulatory culture of genetic tests until 2010, when Pathway Genomics Corporation (PGC) announced plans to sell genetic test kits at Walgreens Pharmacy. Options for reporting the results of the PGC test kit included personalized risk assessments for drug response, disease risks, and pre-pregnancy planning . 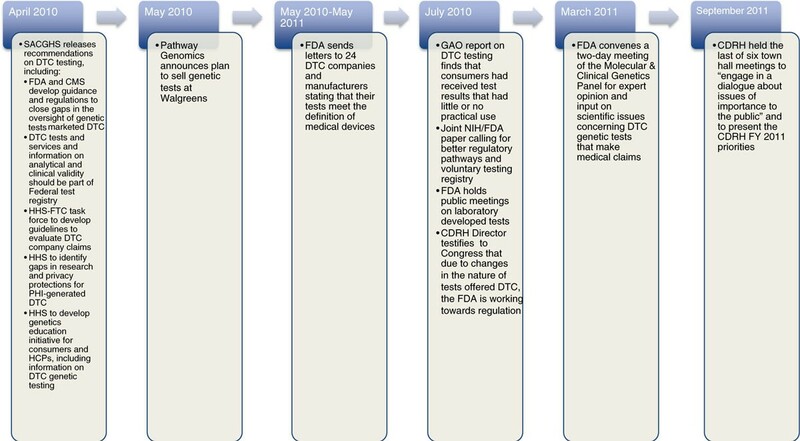 The FDA responded by sending letters to 19 DTC companies, including PGC, in May and July 2010, stating that their tests were medical devices and needed FDA approval. An additional letter was sent to another company that was providing unapproved reagents and instrumentation to DTC testing companies. Three more letters were sent in May 2011 to DTC-GT companies stating their tests met the FDA definition of a device. In July 2010, the FDA held public meetings on laboratory-developed tests, including genetic tests, with plans to develop a draft oversight framework for public comments . In the same month, the Director of the Center for Devices and Radiological Health (CDRH) at the FDA testified to the US House of Representatives Subcommittee on Oversight and Investigations that because of a change in the nature of the genetic tests being offered DTC, FDA was working towards an approach to regulation  (Figure 2). Shift in the regulatory culture of genetic testing. CMS, Centers for Medicare & Medicaid Services; HHS, US Department of Health and Human Services; PHI, personal health information. At the same time, a July 2010 US Government Accountability Office (GAO) report on DTC-GT was released that found that consumers had received DNA-based risk predictions that were misleading and of little or no practical use . Similar findings were reported in a 2006 GAO report focusing on nutrigenomics testing . Also in July 2010, the Directors of the National Institutes of Health (NIH) and FDA published a manuscript  stating that the 'NIH and the FDA will invest in advancing translational and regulatory science, better define regulatory pathways for coordinated approval of co-developed diagnostics and therapeutics, develop risk-based approaches for appropriate review of diagnostics to more accurately assess their validity and clinical utility, and make information about tests readily available.' Hamburg and Collins  also announced the development of a voluntary genetic testing registry, which will include information about whether a genetic test is FDA approved and will help consumers and providers to make informed decisions about genetic testing. In March 2011, the FDA convened a two-day meeting of the Molecular and Clinical Genetics Panel to seek its opinion and input on scientific issues concerning DTC genetic tests that make medical claims. Specific questions were posed to the panel about the risks and benefits of such tests, means to alleviate potential negative consequences, and evidence requirements for the regulation of direct-access genetic testing. In general, the panel agreed that DTC genetic tests should be held to the same quality and standards as prescription tests, and that certain categories of tests, including pre-symptomatic tests for diseases with high disease prediction and potentially severe consequences, as well as pharmacogenetic tests, should require a prescription . FDA regulatory changes have not been announced, but the CDRH held the last of six town hall meetings to 'engage in a dialogue about issues of importance to the public' and present the CDRH fiscal year 2011 priorities . Results of population-based surveys suggest that less than 1% of the general population has used DTC genetic tests that provide personalized risk estimates [96, 97]. Large-scale studies of factors that are associated with consumer uptake of DTC-GT, of the interpretation of results, and of the impact of results on mental health and lifestyle changes are underway [98–103]. Nonetheless, empirical data on the impact of DTC genetic tests that provide personalized risk estimates are limited. To date, receipt of DTC genetic test results does not seem to result in increased psychological distress among users [90, 98, 104] or in fatalistic attitudes about the role of genetics in determining health outcomes [104, 105]. A review of 13 studies providing real or hypothetical DNA-based risk predictions suggests that communicating such risks has little effect on behavior and only a small effect on intentions to change behavior . These findings were supported by Bloss et al. , who found no short-term change in psychological health, diet or exercise behavior, or actual use of screening tests among more than 2,000 users of a DTC genetic test for common complex disorders. Test users did, however, report intentions to undergo more frequent screenings . Kaufman reported that among 1,048 customers of three DTC companies surveyed about responses to DTC-GT, 34% said they were more careful about their diet, 14% were exercising more and 15% changed their medications or supplement regimens . In a randomized trial of 162 asymptomatic adult children of patients with Alzheimer's disease, those who received positive APOE4 genotype results were significantly more likely than controls (no genotype) or those who were APOE4-negative to report any change in health behavior to prevent Alzheimer's disease, such as taking medications or vitamins . It is possible that consumer responses to DTC-GT vary depending on the perceived severity of  and experience with the disease in question . A noted consistency in consumers' intended use of DTC genetic test results is the intention to share the results with a physician. Between 78% and 92% of consumers who would consider DTC-GT that provide personalized risk estimates report they would share their results with their physician [102, 110]. Although actual sharing of test results has occurred significantly less often, ranging from 27% to 66% of consumers [96, 98, 106, 110], the proportion of consumers asking their HCP about health-related DTC-GT and test interpretation is likely to increase. The concerns here are that many providers are unfamiliar with such tests , that provider-patient conversations about such tests could take considerable time  and that the tests could result in unnecessary or inappropriate medical interventions that would drive up medical costs and/or result in inadvertent harm . Although there are few data on the impact of DTPA and direct access genetic testing on HCPs, the literature suggests HCPs are receiving advertising materials for genetic testing and that experience with direct access genetic testing, while minimal, is increasing. Concerns have been raised about the impact of pressures of genetic test marketing on HCPs and on their recommendations to patients . Providers do receive marketing materials about genetic tests [114, 115]. Receipt of advertising materials about genetic testing for inherited cancer susceptibility by HCPs has been associated with increased ordering of genetic testing. In at least one study, however, the majority of physicians surveyed did not perceive DTPA to be an important consideration in their decision to order a test . The Myriad campaigns for BRACAnalysis are among the most well-known examples of the marketing of a genetic test directly to both consumers and physicians [46, 116–118]. The first campaign took place between September 2002 and February 2003 in Atlanta, GA and Denver, CO. The campaign involved TV, print, and radio ads aimed at women and outreach to physicians about genetic testing for inherited breast and ovarian cancer. The advertisements encouraged women to consult their physicians about the genetic test. The CDC investigated the impact of the Myriad campaign on consumers and physicians and found that the campaign increased awareness but not knowledge among physicians [45, 46]. In the six months after the BRACAnalysis campaign was initiated, physicians in cities where the campaign took place reported more patient questions, more requests from patients for referrals and testing, and more tests ordered than in the same time period one year prior [45, 46]. These results suggest that the advertisements did impact patient-provider interactions. Although providers reported ordering more testing during the campaign period, it is not possible to determine if this increased utilization resulted from consumer demand, industry pressures, or more at-risk consumers presenting for testing. However, in a separate study by Mouchawar et al. [47, 119] of Denver Health Maintenance Organization (HMO) physicians, most physicians reported no strain on the physician-patient relationship as a result of the DTCA campaign and no effect on clinical practice. Although genetic referrals increased at the Denver HMO, testing of low-risk women did not increase. Surveys of providers suggest that awareness of direct-access genetic testing among HCPs is increasing but that knowledge of genetic testing is limited. As part of the DocStyles survey, Kolor et al. found that 42% of 1,880 HCPs (family physicians, internists, pediatricians, obstetricians, gynecologists, dermatologists and dieticians) were aware of genomic risk profiling described as tests that 'scan a person's entire genetic makeup for potential health risks.' Among those aware of such tests, 42% had at least one patient ask about such DTC-GT in the previous year, and 15% had at least one patient bring in the results of a genomic risk profile for discussion. Among those who had a patient bring in results, 75% said the genetic test results changed the patient's care . What is not known is whether the changes made (which were described as offering screening tests, changing medications or doses, recommending lifestyle changes, changing the frequency of follow-up appointments, or making a diagnosis) were necessary, clinically beneficial or based on existing guidelines or clinical evidence. A survey of 382 family and internal medicine providers in North Carolina found that 39% were aware of DTC genetic tests that scan a person's entire genome. Of those aware of genomic risk profiling (n = 148), 19% had had a patient ask about testing but only 3% (n = 5) reported having had a patient who brought in DTC-GT results. Only one provider reported making any recommendations on the basis of DTC-GT results, and these were related to lifestyle changes. Most of the HCPs who took part in this study (85%) did not feel prepared to answer questions about DTC-GT, but 43% of those who were aware of DTC-GT thought that testing would be clinically useful when formulating medical management plans . Awareness among HCPs of DTC-GT is increasing globally. The availability of tests on the internet and the limited regulation in countries outside the US could mean that providers in other countries will see an increase in patients using DTC-GT [12, 121, 122]. Although consumers are more likely to consult physicians about DTC-GT results than genetic counselors , genetic specialists are also reporting referrals that are based on DTC-GT results [123, 124]. A survey of genetic counselors, focusing on health-related DTC-GT that could also be offered in a clinical-genetics setting, found that 14% of 312 respondents had had patients ask for interpretation or discussion of their DTC-GT results. More genetic counselors agreed with statements about potential risks rather than those about prospective benefits of DTC-GT. Nevertheless, there were scenarios in which DTC-GT was considered acceptable. Over 70% of genetic counselor respondents would consider DTC-GT for a patient who was concerned about discrimination or who wanted anonymous testing, and 90% would consider DTC-GT if their patient was faced with geographical constraints . Subsequent to the FDA letters in 2010, more DTC-GT companies are requiring physician-ordered testing. At least one DTC company has sought and established partnerships with physicians to offer their genomic risk profiling services. According to the website of this DTC company, the 'Physician Program' includes both a complimentary genetic analysis for the affiliated physician and reduced rates for patients referred within 90 days of establishing the partnership. Researchers at Duke University surveyed primary care physicians in the MDVIP network, which participates in the Physician Program, and found that 30% of 154 respondents had ordered a genomic risk profile of themselves and 42% had ordered the test for a patient. Those respondents who felt well-informed about genomic risk testing were more likely to order the genomic risk profile for themselves and for patients than those who did not feel well-informed. Physicians who had undergone testing for themselves were also more likely to order the test for their patients than those who had not had testing. The top four concerns about genomic risk profiling for patients included uncertain clinical utility (63%), risk of long-term disability or life insurance discrimination (59%), costs of the test (59%), and confidentiality (38%) . Consumers are likely to interface with HCPs for consultation about DTC-GT, to obtain understanding of test results, and/or to make health-related decisions, and most HCPs report that they feel a professional responsibility to help interpret test results [96, 97, 110, 123, 124, 126]. Consumers' decisions to undergo DTC-GT could impact providers and the medical community in many ways, including placing an increased burden on the HCP in terms of time and costs and increased utilization of unnecessary medical services. Consumers might rely on HCPs when deciding about the appropriateness of genetic tests that are marketed DTC . As noted, however, physicians are not prepared to discuss this information with patients or to provide guidance about such testing [120, 128]. In fact, limited physician knowledge about even the most mainstream genetic tests suggests that the competency of HCPs to explain the results of DTC-GT is limited [45, 129, 130]. Novel efforts are underway to educate providers about DTC-GT, such as holding education sessions to offer faculty or physician-employees personalized genetic risk assessments and incorporating information about personalized genotyping into medical school curricula through genetics educators and partnerships with DTC-GT companies [126, 131, 132]. Concerns have been raised, however, about some of these educational methods, including potential conflicts of interest when education is provided by DTC-GT companies who have a vested interest in promoting testing, implied endorsement of testing when offered by employers or educators, and the impact of abnormal results on family members or the health care system; for example, the test results could suggest that other family members are at-risk, or providers who are not involved in the education may need to interpret results that have no clear clinical validity or utility . Although education using anonymous DTC-GT results helps improve knowledge and changes opinions about the clinical utility of genome-wide association-based DTC tests , educational efforts to reach wider HCP audiences effectively remain elusive. Clinical guidelines and policy statements from professional organizations and workgroups can also impact HCPs' knowledge of DTC-GT and testing decisions (Figure 1). A number of clinical guidelines and position statements have been published regarding DTC-GT [133–143]. Most recognize the importance of involving a qualified health professional in ordering and interpreting such tests, as well as in providing pre-test and post-test counseling about the risks, benefits and limitations of the test. Many also call for increased regulatory oversight (Table 2). The existence of clinical guidelines for a DNA-based test has been associated with more appropriate use of the test in the context of a DTC campaign . Price et al. found that DTCA of the human papillomavirus DNA test was associated with increased overall use (appropriate and inappropriate) of cervical cancer screening tests, whereas the release of clinical guidelines was associated with increased appropriate use and concluded that 'guidelines have the potential to affect clinicians' practices appropriately even in the context of product advertising.' Awareness of guidelines about genetic testing has also been associated with increased knowledge of genetic testing . Thus, clinical guidelines are essential to promote the informed use of DTC-GT. 1Should also seek guidance from a genetics professional. 2For test interpretation. Available studies suggest that DTC-GT results that are returned directly to consumers have little impact on consumer behavior [98, 104], however it is unclear whether consumers are more likely to adhere to physician recommendations that are based on DTC-GT results. Additional research is needed to understand how HCPs respond to DTC genetic test results that are brought to the medical visit by consumers. If the physician's medical management recommendations do have a greater impact on health outcomes than consumer-driven decisions, additional evidence-based guidelines for providers and insurers will be crucial in increasing knowledge about the appropriate use of genetic tests that are advertised and sold DTC. Strategies that have been most effective in encouraging the adoption of clinical practice guidelines include reminder systems, individual in-person meetings with physicians to persuade them to adopt guidelines, and strategies that involve two or more interventions . Multiple education approaches will be needed to increase HCP knowledge of DTC-GT. In addition to HCP education through the development and promotion of guidelines, the integration of genetic content in medical and school curricula, continuing-education programs, conferences, and publications, as well as novel approaches to HCP education, are needed. A recent Secretary's Advisory Committee on Genetics, Health and Society (SACGHS) report on 'Genetics Education and Training' emphasized the need to integrate more genetics content into undergraduate and graduate curricula for many health care fields in order to ensure a well-trained workforce . Evaluations of any such educational programs will be essential to ensure a substantial and sustainable impact. Increased preparedness of the health care community is needed. DTCA is likely to continue, although the format may change. Whole-genome and exome sequencing is already available DTC  and exome sequencing recently became available on a clinical basis . Genetic testing of minors in a DTC context is a concern that is also receiving increasing attention [148, 149]. HCPs and public health officials need to establish plans to provide services in light of the availability of DTC-GT. Although the recent actions by the FDA suggest a change in the regulatory culture of genetic testing, particularly with regard to tests that are advertised and sold DTC, debate over the regulation of genetic testing will continue. Outcome data on the clinical validity and utility of personalized genomic tests are needed to help guide this debate. To facilitate such conversations, collaborations on research and clinical approaches to assess the impact and utilization of DTC-GT on providers and consumers, including long-term health outcomes, costs and benefits to the health care industry and society, and the impact on patient and provider interactions, are needed [82, 87]. The author would like to thank Jessica Connor, MS, Leslie Gress, and Maureen Osak for their assistance with references, figures, and tables.